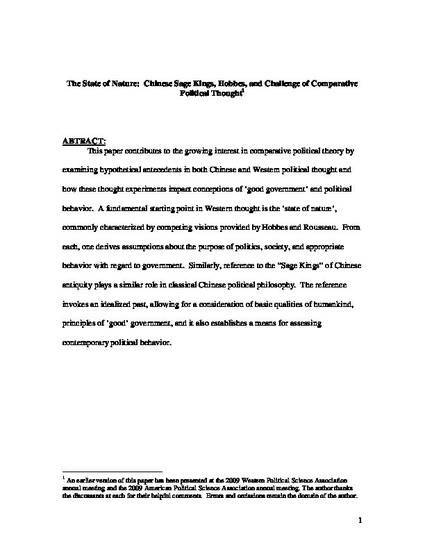 This paper contributes to the growing interest in comparative political theory by examining hypothetical antecedents in both Chinese and Western political thought and how these thought experiments impact conceptions of ‘good government’ and political behavior. A fundamental starting point in Western thought is the ‘state of nature’, commonly characterized by competing visions provided by Hobbes and Rousseau. From each, one derives assumptions about the purpose of politics, society, and appropriate behavior with regard to government. Similarly, reference to the “Sage Kings” of Chinese antiquity plays a comparable role in classical Chinese political philosophy. The reference invokes an idealized hypothetical past, allowing for a consideration of basic qualities of humankind, principles of ‘good’ government, and it also establishes a means for assessing contemporary political behavior.